Purpose: To evaluate the efficacy of selective laser trabeculoplasty (SLT) in eyes with open-angle glaucoma (OAG) in early and advanced stage. Material and methods: Retrospective review of patients treated with SLT in our hospital with a follow-up time of 6 months. 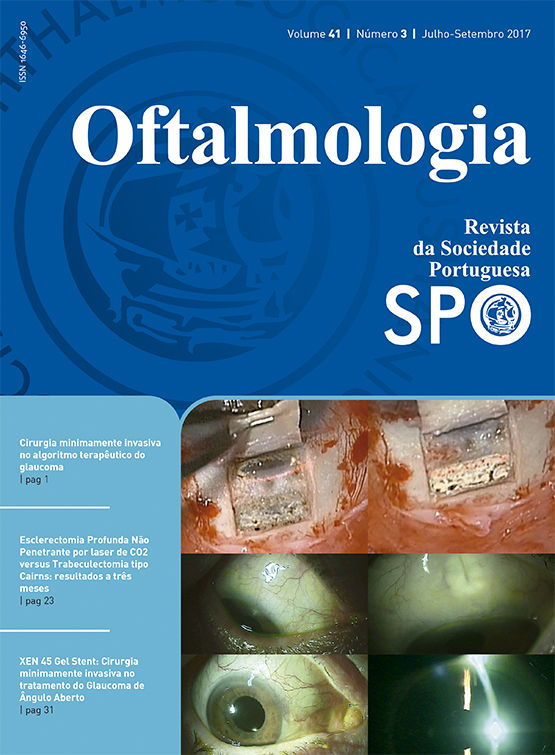 SLT was performed in eyes with primary or pseudoexfoliation OAG. Indications for the procedure were insufficient intraocular pressure (IOP) control or poor compliance to medical treatment. IOP records were obtained preoperatively, 2 weeks, 2 and 6 months after laser treatment. There were considered as success criteria in early glaucoma group a reduction of IOP<21 mmHg and> 20% of the initial IOP, and for advanced glaucoma group a reduction of IOP<18 mmHg and> 20% from baseline. Results: Forty-four eyes from 34 patients were included in the study. In early glaucoma stage group, it was observed a mean IOP reduction of -7.46 mmHg (p<0.001) and IOP reduction <21 mmHg and >20% of the preoperative value was observed in 76.9% of eyes at 6 months of follow-up. In advanced glaucoma stage group, it was observed a mean IOP reduction of -5.30 mmHg (p <0.001) and IOP reduction IOP <18 mmHg and> 20% of the preoperative IOP was observed in 78.9% of eyes at 6 months after completion of SLT. There were no reports of complications associated with SLT. Conclusions: At 6 months the SLT seems to be a safe and effective procedure in the treatment of eyes with OAG in early and advanced stage.